Scotland's real life Hamish Macbeth has become a victim of crime for the first time - just days after leaving his job. Pc David Inglis, 51, who has spent the last nine years patrolling Britain's remotest beat in Sutherland, had his wallet stolen in Inverness. On his own patch he had never come across any thefts against people. "I felt humiliated," he said. "In my time I even remember a £5 note being handed in as lost property. That's how honest people are in my area." 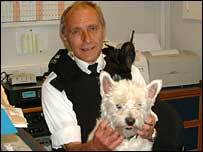 The theft happened just three days after Pc Inglis - who, like fictional Highland policeman Hamish Macbeth, has a West Highland terrier - hung up his truncheon having worked for Northern Constabulary for 30 years. While talking to shop staff about tiles for his new home he left his wallet on the counter. Moments later he realised it had been stolen. It contained £40 in cash, a number of credit and debit cards and his driving licence. Pc Inglis had to persuade bank staff to allow him to withdraw enough money for him to drive home. "I have never been a victim of crime before," he said. "I can't remember the last time I dealt with a case of theft - it is certainly over a year and I have only ever dealt with half a dozen in my time on my beat. "In fact, the only one I remember was a group of Italian tourists who took a £200 bottle of malt whisky from a hotel in Tongue and I caught them in Durness and made them give it back. "The lads at the station in Inverness were very professional and took my details, but there was a bit of gentle ribbing and a wee smile on their faces." The long-serving policeman said he felt shocked by the incident. "I am angry at my own stupidity," he said. "It is ironic. I was always telling folks in my patch to be careful when they are away and visiting strange places. Then I don't heed my own advice. "If my wallet had been lost in my patch it would have been handed in. But one thing's for sure - nobody would have stolen it." 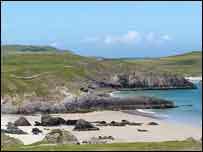 His last crime list for July was just one unpaid £11 meal - the result of a foreign couple running off without paying at a Durness restaurant - a minor road traffic accident and a dead sheep, possibly caused by dog worrying. Pc Inglis, who is technically still a policeman until the end of October, also had to deal with a false alarm with good intent after canoeists failed to tell locals where they were heading. He was responsible for 900 sq miles of Highland wilderness - the longest single beat in Europe. He had just 1,100 people on his patch, which he patrolled in his Ford van in an area that stretched for 100 miles from Elphin to Loch Eriboll. In nine years, he only ever dealt with one-break-in and never dealt with a murder, serious crime or drug offence. Northern Constabulary hopes to announce Pc Inglis' successor in the next few weeks. Other officers are carrying out his duties in the meantime.